On episode 124, Harley and Brett are dusting off the history books to explore the city of Richmond, Virginia. the Best Affordable Place To Take A Vacation, the “most fun and affordable U.S. city, 2014’s Best Destinations, and the Best U.S. Historical Destination. The Hollywood Vampire is a legend that has haunted Richmond, VA and the historic Hollywood Cemetery since the 1920’s. Local residents claim that the mausoleum of W. W. Pool holds the remains of a vampire. Where can you find the Hollywood Vampire? Do you show the signs of being a vampire? Is Brett Manzer a vampire? 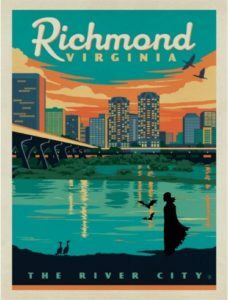 With all of the accolades thrust upon Richmond, you would think there would be loads of entertainment and you would be right. If you interests are more literary than Anne Rice, we suggest you check out the Edgar Allan Poe Museum. This museum celebrates the grim author’s life and work with one of the largest collections of letters, manuscripts, and artifacts related to the writer. They also have is socks, which seems to be a little stalkerish to us. When you are ready for give your dogs a rest and grab some food…Unleashed – Gourmet Hotdogs can’t be beat!